اسحاقی گرجی, زهرا, ابراهیم پور گرجی, علی, ریاحی, سیاوش. (1395). مطالعه مولکولی ثابت هنری گاز کربن دی اکسید در حلال‌های خالص. نشریه شیمی و مهندسی شیمی ایران, 35(4), 99-110. زهرا اسحاقی گرجی; علی ابراهیم پور گرجی; سیاوش ریاحی. "مطالعه مولکولی ثابت هنری گاز کربن دی اکسید در حلال‌های خالص". نشریه شیمی و مهندسی شیمی ایران, 35, 4, 1395, 99-110. اسحاقی گرجی, زهرا, ابراهیم پور گرجی, علی, ریاحی, سیاوش. (1395). 'مطالعه مولکولی ثابت هنری گاز کربن دی اکسید در حلال‌های خالص', نشریه شیمی و مهندسی شیمی ایران, 35(4), pp. 99-110. اسحاقی گرجی, زهرا, ابراهیم پور گرجی, علی, ریاحی, سیاوش. مطالعه مولکولی ثابت هنری گاز کربن دی اکسید در حلال‌های خالص. 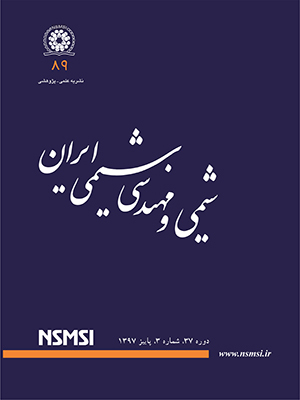 نشریه شیمی و مهندسی شیمی ایران, 1395; 35(4): 99-110. حذف گازهای اسیدی از جمله کربن دی اکسید از جریان‌های گازی، یکی از معضل ­های اساسی در صنعت است؛ چون وجود این گاز مشکل ­های زیادی را در فرایندهای دیگر ایجاد می‌کند. هدف از این کار، یافتن حلال‌هایی است که بهترین عملکرد را در جذب CO2 داشته باشند. مقدارهای ثابت هنری برای کربن دی اکسید در گروهی از حلال‌ها با استفاده از مدلی که از روش رابطه کمی ـ ساختار ویژگی (QSPR) ایجاد شده است، محاسبه شده است. در ابتدا مولکول‌های حلال براساس یکی از روش‌های نظریه تابعیت چگالی (DFT) به نام B3LYP و با مجموعه تابع­ های ++ G (d. p)31-6، در نرم‌افزار گوسین بهینه‌سازی شده و سپس توصیف‌کننده‌های مناسب با استفاده از نرم‌افزار دراگون محاسبه شدند. توانایی مدل با دو توصیف کننده ساده مولکولی شامل تعداد گروه عاملی هیدروکسیل (n-ROH) و اندیس محوری بالابان (BAC)، برای پیش‌بینی ثابت هنری به روش اعتبارسنجی متقاطع حذف یکتایی سنجیده شده است و مقدار ضریب تعیین برای مدل‌ اصلی ارایه شده به تقریب برابر با 95/0 می­ باشد. میانگین انحراف نسبی این مدل‌ نیز کمتر از 7% بود. نتیجه­ های به­ دست آمده نشان از دقت بالای مدل و توافق بسیار خوب آن با مقدارهای اندازه‌گیری شده در منابع علمی گوناگون دارد. Bohloul, M.R., Vatani, A., Peyghambarzadeh, S.M., Experimental and Theoretical Study of CO2 Solubility in N-Methyl-2-Pyrrolidone (NMP), Fluid Phase Equilibr, 365: 106-111 (2014). Intergovernmental Panel on Climate Change, “Carbon Dioxide Capture and Storage”, United Nations, 1st Edition, (2006). Gui X., Tang Z.G., Fei W., CO2 Capture with Physical Solvent Dimethyl Carbonate at High Pressures, J. Chem. Eng. Data, 55: 3736–3741 (2010). Sandler S. I., “Chemical and Engineering Thermodynamics”, (3rd ed. ), New York: Wiley, (1999). Gui X., Tang Z.G., Fei W., Solubility of CO2 in Alcohols, Glycols, Ethers, and Ketones at High Pressures from 288.15 to 318.15 K, J. Chem. Eng. Data, 56: 2420–2429 (2011). Altschuh J., Bruggemann R., Santl H., Eichinger G., Piringer O.G., Henry’s Law Constant for a Diverse Set of Organic Chemicals: Experimental Determination and Comparison of Estimation Methods, Chemosphere, 39(11): 1871-1887 (1999). Lin Sh.T, Sandler S.I., Henry’s Law Constant of Organic Compounds in Water from a Group Contribution Model with Multipole Corrections, Chem. Eng. Sci., 57: 2727-2733 (2002). Majer V., Sedlbauer J., Bergin G., Henry’s Law Constant and Related Coefficients for Aqueous Hydrocarbons, CO2 and H2S Over a Wide Range of Temperature and Pressure, Fluid Phase Equilibr, 272: 65–74 (2008). Jou F.Y., Desmukh R.D., Otto F.D., Mather A.E., Vapor–Liquid Equilibria for Acid Gases and Lower Alkanes in Triethylene Glycol, Fluid Phase Equilibr, 36: 121-140 (1987). Lotfollahi, M.N., Baseri, H., Haghighi Asl A., High Pressure Phase Equilibrium of (Solvent + Salt + CO2) Systems by the Extended Peng-Robinson Equation of State, Iran. J. Chem. Chem. Eng. (IJCCE), 27(4): 97-105 (2008). Uyan M., Sieder G., Ingram Th., Held Ch., Predicting CO2 Solubility in Aqueous N-methyldiethanolamine Solutions with ePC-SAFT, Fluid Phase Equilibr, 393: 91-100 (2015). سید حمید حسینی، امیرعباس ایزدپناه، حسین رهیده، مدل سازی ترمودینامیکی حلالیت کربن دی اکسید در محلول آبی متیل دی اتانول آمین با استفاده از معادله حالت مکعبی به اضافه تجمعی (CPA)،نشریه شیمی و مهندسی شیمی ایران، (4)34: 45 تا 57 (1394). Goharrokhi M., Taghikhani V., Ghotbi S., Safekordi A.A., Najibi H., Correlation and Prediction of Solubility of CO2 in Amine Aqueous Solutions, Iran. J. Chem. Chem. Eng. (IJCCE), 29(1): 111-124 (2010). Rayer A.V., Henni A., Tontiwachwuthikul P., High Pressure Physical Solubility of Carbon Dioxide (CO2) in Mixed Polyethylene Glycol Dimethyl Ethers (Genosorb 1753), Can. J. Chem. Eng., 90(3): 576-583 (2012). Hansch C., Leo A., Exploring QSAR. “Fundamentals and Applications in Chemistry and Biology”, ACS, Washington, D.C., (1995). Todeschini R., Consonni V., “Molecular Descriptors for Chemoinformatics”, 2nd ed., Wiley-VCH, Weinheim, (2009). Momeni M., Riahi S., Prediction of Amines Capacity for Carbon Dioxide Absorption in Gas Sweetening Processes, J. Nat. Gas. Sci. and Eng., 21: 442-450 (2014). Henni A., Tontiwachwuthikul P., Chakma A., Solubilities of Carbon Dioxide in Polyethylene Glycol Ethers, Can. j. Chem. Eng., 83: 358-361 (2005). Frisch, Michael J., Nielsen, Alice B., Frisch, Aeleen (Eds. ), “Gaussian 98”, Gaussian Incorporated, 1998. Michalewicz, Z., “Genetic Algorithms + Data Structures = Evolution Programs”, 3rd ed., Berlin: Springer-Verlag, (1998). Jolliffe I.T., “Principal Component Analysis”, Springer-Verlag, New York, (1986). Todeschini R., Consonni V., “Handbook of Molecular Descriptors”, Wiley VCH Verlag GmbH, 11, (2000). Balaban, A.T., XXXIV. Five New Topological Indices for the Branching of Tree-Like Graphs, Theor. Chim. Acta, 53: 355-375 (1979). A. Golbraikh A., Tropsha A., Beware of q2!, J. Mol. Graph. Model., 20(4): 269-276 (2002). Netzeva T.I., Worth A.P., Aldenberg T., Benigni R., Cronin M.T., Gramatica P., Yang C., Current Status of Methods for Defining the Applicability Domain of (Quantitative) Structure – Activity Relationships, ATLA, 33: 155-173 (2005). Gramatica P., Principles of QSAR Models Validation: Internal and External, QSAR Comb. Sci., 26(5): 694–701 (2007). Xu Y., Schutte R.P., Hepler L.G., Solubilities of Carbon Dioxide, Hydrogen Sulfide and Sulfur Dioxide in Physical Solvents, Can. J. Chem. Eng., 70 (1992). Singh P., Niederer J. PM., Versteeg G.F., Structure and Ativity Relationships for Amine Based CO2 absorbents—I, Int. J. Greenh. Gas. Con., 5-10 (2007). Singh P., Niederer J. PM, Versteeg G.F., Structure and activity Relationships for Amine Based CO2 Absorbents-II, Chem. Eng. Res. Des., 87: 135-144 (2009).